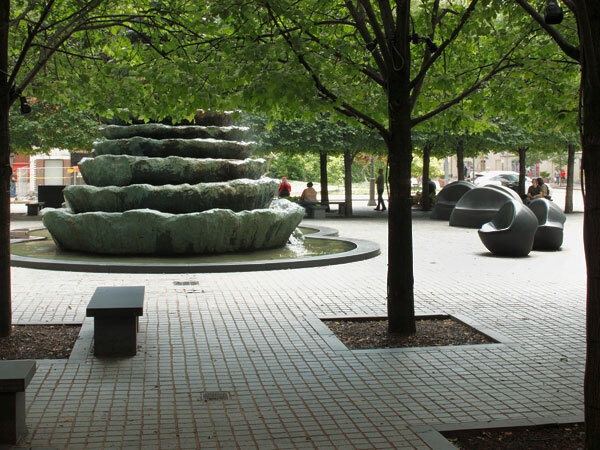 This half-acre public plaza, which officially opened in 1999 in Pittsburgh’s downtown Cultural District, was a collaborative design effort between architect Michael Graves, Dan Kiley, and artist Louise Bourgeois. The space, on the corner of 7th Street and Penn Avenue, was commissioned for the Theater Square Project (designed by Graves) and is buttressed on two sides by high-rise buildings. 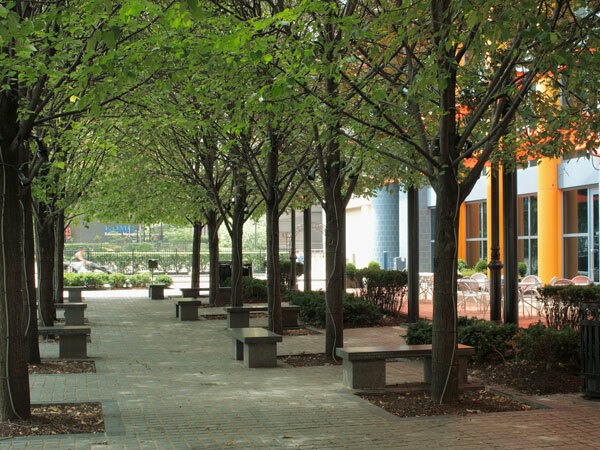 Tree-lined brick sidewalks flow into a 23,000-square foot expanse paved in dark gray, two-inch-square granite tiles. Rectangular planting beds of low, clipped hedges line the borders of the plaza, and on three sides Kiley planted 32 littleleaf lindens closely-spaced in double rows and clipped to create a U-shaped columnar wall open towards Penn Avenue. At the center of the square, sits a 25-foot high bronze fountain set within a deep circular basin. Sculpted by Bourgeois, it was the artist’s largest public art commission in the U.S. at the time. 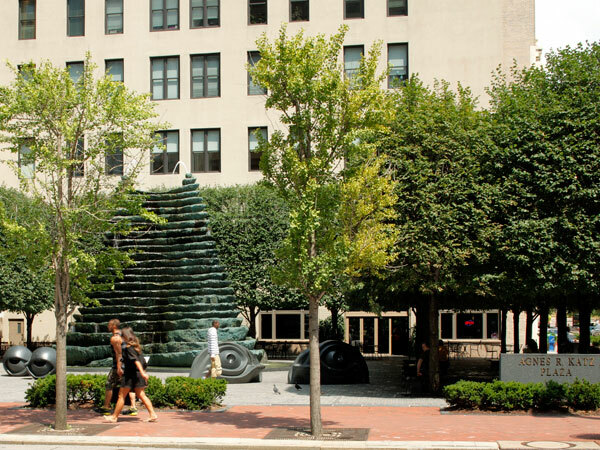 The fountain’s conjoined terraced cones spout two cascading rivulets, alluding to the city’s hilly topography and the adjacent Allegheny River. 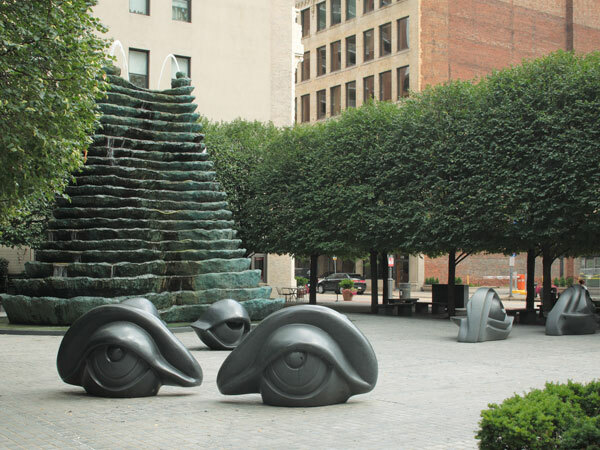 Bourgeois also furnished the central terrace with three pairs of large granite benches sculpted like human eyes – hence the plaza’s colloquial nickname, “Eyeball Park.” To these, Kiley added 22 backless granite benches, which are placed under the trees. 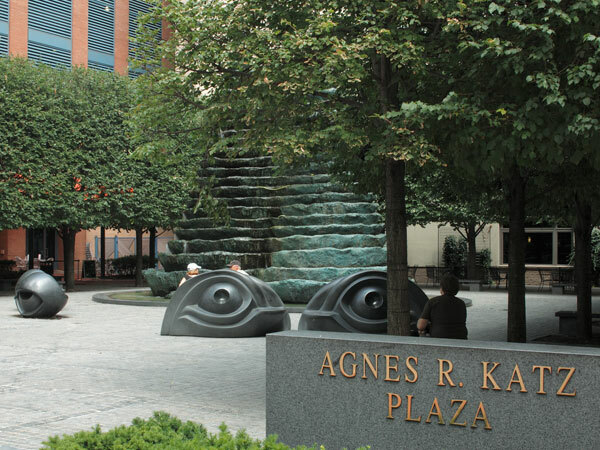 The plaza was named posthumously for Agnes R. Katz, a local patron of the arts. The Pittsburgh Cultural Trust uses the space as a venue for outdoor performances.